What did we learn from Key Bets analyst Cameron O'Brien? I tuned into Cameron O’Brien’s webinar last week, and it was a really interesting look at the mathematical process of putting a price on a horse (or any selection really, such as a sporting team etc.). While I’ve seen plenty of discussions with the analysts, this was something a little different to just a look at how a successful punter does the form. It’s well worth a proper watch, but I’ve put together my highlights of the discussion in terms of what really stood out for me – hopefully that gives you a bit of a guide if you haven’t yet seen it and want to take a look. It can get a little bit maths-focused – though Cam does a good job of keeping it as simple as possible – so I think it’s important to keep your mind on the important concepts. We started with the absolute importance of price and value when betting. This is something that analysts and punters talk a lot about, and Cam reaffirmed its importance when opening the webinar. It doesn’t matter how often you pick winners, if you’re not taking price and value into account, it’s basically impossible to make money. Don Scott had this view when he put together his landmark books on punting and making money decades ago, and it holds true today. The most traditional way of putting a price on a selection, that demonstrated by Scott, is a very rigid approach to pricing. It relies entirely on a horse’s rating, ensuring any horse or race with that same rating is priced the same no matter what other factors may be present. An important next step is taking into account how likely it is that the horse will run up to its rating. This is important, as they’re not machines! They don’t run up to their mathematical rating every time they step onto a track. But with a horse’s history, we can start to get an idea of how often that particular horse runs to its rating. That gives us the probability of that occurring in the upcoming race we’re looking at, so we can take it into account with our prices. We already have a rating for each horse, and this allows us to plot each horse’s likely performance to that rating based on how often it produces. The key to it, I think, is that for a single upcoming race we might see any sort of performance within the range… but over time, the probabilities make our figures accurate. The mathematical probability that it will produce that performance. This is based on how often it has done so in the past. For example, a certain horse may run to its ability 4 out of every 10 times. Comparing that for all horses in the race to see what the most likely outcome is, and converting that into a price which can be compared with what bookies are offering, to see if we can get a value bet. I hope that gives some sort of small introduction into what Cam was talking about. He certainly explains it far better than I do! I think if you go into the lesson with those basic concepts in mind, you’ll certainly find it interesting. 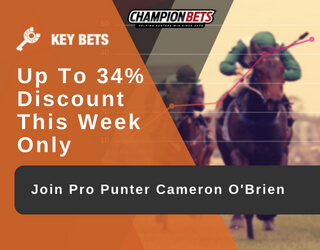 Key Bets members have profited $1,600 in the last three weeks since a change in approach from analyst Cameron O’Brien. With value now the focus rather than clear top-raters, the big priced winners have come. A proven ratings-based approach from a 10-year professional with a keen eye for value. Start winning with Key Bets today.